To confirm your registration a deposit of 420€ TTC is required. Please note that food and accommodation are not provided for this course. However we have listed below accommodations for students. We have listed accommodation located nearby the yoga shala. Traveling in India does not cost that much. We do not wish to propose a Yoga course or Yoga immersion with an unreasonable rate. You can find cheap accommodation in India, with good services. Food is very cheap as well and delicious. A meal can cost you per day 4€ to 10€ per day (maximum). In any case, should you have any issue finding your accommodation please do not hesitate to contact us. If the owner of the place does not reply to your request, please send an email to: truptayoga@gmail.com. Booking & Reviews: Patnem Garden Cottages, aller directement sur le lien suivant. Booking and Reviews: Om Shanti Patnem en cliquant ici. 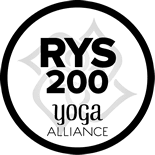 Our Yoga Teacher Training course is credited with Yoga Alliance US. 1.You need a Visa. Please check the VFS Center in your country. 2. The airport is DIABOLIM. Once you have book your accommodation give all flight detail to the hotel in order to arrange the transportation. 3. There is no need a vaccine. However better to consult a health center before travelling if you feel more comfortable. 4. Do no drink tap water. 5. You can brush your teeth with the tap water. 6. Bring mosquito repellent such as Geranium (essential oil) or lavender. It is not recommended to attend any yoga teacher training course while pregnant. Do not have any surgery 6 months before the course starts. Be in a good health. Please consult your doctor if you feel it necessary. A deposit of 420€ TTC is necessary. It has to be done through wire transfer. An invoice will be send to you. The deposit is not refundable but can be transfer to any yoga teacher training course with us. The deposit is deductible from the course fees. Course fees has to be paid two months before the course starts.